Lymphocytes went from 25 to 15 showing a normalization of the immune system. This is reflected in the blood. 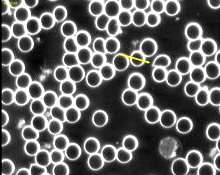 Obvious changes are apparent and the walls of the blood cells have normalized within a very short period of time. This was very noticeable and very surprising to the tester. NOTE: All tests conducted by Blushield. TO VERIFY THAT ELECTROSHIELD CAUSED A CHANGE IN STRESS STATUS AND ORGAN FUNCTION. A urine analysis was undertaken on a diverse range of persons numbering 10. All persons have a different stress status and different life styles. This study was undertaken over a 43-day period enabling us to see what effects the Electroshield has on a person’s overall stress. Urine tests accurately map a person’s organ function in percentile, enabling us to see if any change, positive or negative, has taken place. Tests were carried out before the Electroshield was installed to get some idea of each individuals stress status. We would compare results later to see if there were any changes. Also urine was taken for testing on the 3rd day following installation and then 13th and 43rd days respectively. Three persons were retired or semi-invalid so spent a longer period in the presence of the Electroshield. All other persons spent less time exposed to an Electroshield. No persons were currently undergoing any therapy at the time of testing nor were any on medications or drugs that would adversely affect testing results. Results of the Urine testing clearly show that all persons undergoing the testing showed an increase in organ function, this shows a clear reduction in stress. Case 1 Female 44 Non-smoker, average fitness, minor health complaints. 10% increase, less stress. Case 2 Female 42 Non-smoker, average fitness, very tired. 7% increase, more energy. Case 3 Male 9 ADD child, moody, digestion problems. 16% increase, a lot less moody, less stress. Case 4 Female 29 Non-smoker, overweight, works in smokeyenvironment. 10% increase, less stress. Case 5 Female 16 Smoker, drinker, late nights, poor digestion. 2% increase despite unhealthy lifestyle, more energy. Case 6 Male 47 Non-smoker, poor digestion, on pain killers. 16% increase, immense improvement in stress levels despite condition. Case 7 Female 40 Non-smoker, asthma, low energy 27% increase, more energy, liver, and circulation improved. Case 8 Female 70 Non-smoker, arthritis, liver and gallbladder conditions. 14% increase, improved stress levels and more energy. Case 9 Female 53 Non-smoker, average fitness, not active. 24% increase, a significant decrease in stress. Case 10 Male 66 Smoker, poor digestion, relatively fit. 38% increase, showed the most decrease in stress with the biggest improvement in digestion. In reference to the first graph you can clearly see the difference in test subjects both before and after. There is an obvious clear increase in organ function. 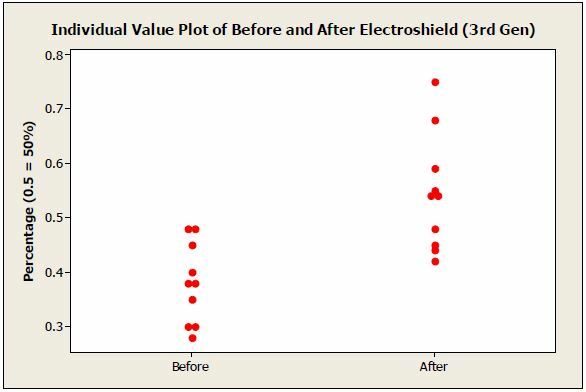 In reference to the second graph there is a dot plot graph showing the clear difference, in before and after testing. 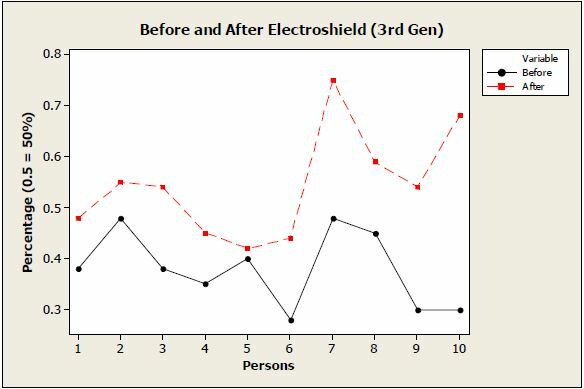 These results suggest not only does the Electroshield protect the body from dangerous EMF radiation; it clearly improves the users stress levels and organ function. If the Electroshield only helped with radiation, we would expect to see no real change in the stress status of each individual. The fact that there was a change suggests that less stress was experienced by each individual undergoing the test. The Blushield was used in a trial to determine how the Blushield would affect egg-laying chickens in an egg farm. Use of the Blushield in Minnesota USA reported the adjacent hen house was being affected by the use of the Blushield in the barn for cattle etc. Turns out the hen house was producing twice as many eggs as per normal. This trial was carried out to prove this hypothesis. H0 = the installation of a Blushield does directly affect stress levels of egg laying hens. The tests were carried out at Braemar Poultry Farm, Te Puna situated on the outskirts of Tauranga, New Zealand. The farm had two completely automated houses. One was selected as the Test House and the other as the control House. The breed of hen that was being tested was commonly known as a ‘Shaver’. The plug‐in Blushield’s were placed at 10-meter intervals and were switched on. The house had approximately 10,000‐15000 laying hens in at any one time. We then took 5 hens in each given sector and carried out blood tests on them, noting such things as parasites, blood cell count and platelet shape and size. Also, the general health of the chicken was noted as to feather loss, weight, skin rashes and any other features that we felt relevant. The weight of the eggs laid each day was averaged out with samples taken from each sector. The same applied to quantity, shell thickness and yolk quality. Blood tests were carried out at one month and three monthly intervals. One month after starting the second blood tests were carried out again picking 5 chickens in each sector. 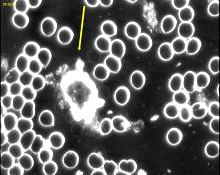 We found that the parasites that were current in the original blood samples had now virtually disappeared, the blood cell count had evened out, platelet size and shape remained the same. The general health of the hens appeared to be better all round and the hens were quieter and more docile to handle. The owner of the farm also made a comment that the noise level in number one house had dropped considerably since the installation of the devices. Before installation, the death rate in both houses had been approx. 60‐100 per month, in the weeks immediately after installation the death rate in-house one dropped to zero and rose to 4 & 6 respectfully in the following two weeks. The egg production before installation was between 74 and 78% of the total flock in-house one, after one month the average rose to between 82 and 84%. The yolk size and color had improved slightly; the color had changed and become a deeper yellow color. Eggs had increased in size by an average of 1mm. The shell appeared to be less fragile in nature although there was not any significant change in the thickness of the shell. The health of the chickens appear to be at a constant level now, parasites appear to have been eradicated from the blood, cell count remains even and platelet size and shape remains regular.Mortality Rate after four months Deaths have declined to between 8 and 15 chickens per month in-house one and appear to have leveled off so this is a significant gain. Egg production has now risen to between 84 and 87% of the total flock in house one. As old stock is culled at 80 weeks, new stock is brought in and egg quantities will vary over this period of change, also the egg sizes will vary as the pullets start laying. (Firstly they will lay smaller eggs) There has been a slight increase in yolk size on average. The egg size has risen overall, there are more 7 and jumbo eggs being produced (up about 10‐15%) The shell has definitely become stronger and less brittle. Health of the chickens appear to be at a constant level now, parasites appear to have been eradicated from the blood, cell count remains even and platelet size and shape remains regular.Mortality Rate after four months Deaths have declined to between 8 and 15 chickens per month in house one and appear to have levelled off so this is a significant gain. Even though there were several changes in the flock during the year regards culling and new pullets being introduced, the blood samples taken, showed no signs of parasites returning. The general health of the hens remained at a good level with no signs of virus or skin diseases evident. The noise levels were constantly lower at all times compared to the control house. The hens appeared to be more content in their environment and there was less pecking between hens. There was also a drop in the amount of food eaten by the chickens, yet the output in eggs and quality had increased. The appetite in the control house, however, remained the same. The mortality rate was the most significant factor of these tests. At no stage did they creep over the 25 per month and averaged out at about 16‐18 level, the hens appeared to have lost a lot of their aggressive nature and cannibalistic habits. This was a significant drop as at the start before the tests the mortality rate was from 60 to 100 chickens. Egg production rose to as high as 89% at times but ended up averaging between 84 and 87% which equates to a good 10% increase in production for the farmer. The quality of the eggs remained at a high level throughout with a consistent improvement in color of the yolk and better viscosity in the egg whites. The egg size definitely increased overall. The average egg weight went from 63 grams to 66 grams. The shell did not improve greatly in thickness; however, crack testing gave an indication that the shells were stronger. There were definitely some extremely good gains in egg production and the large drop off in mortality rates. 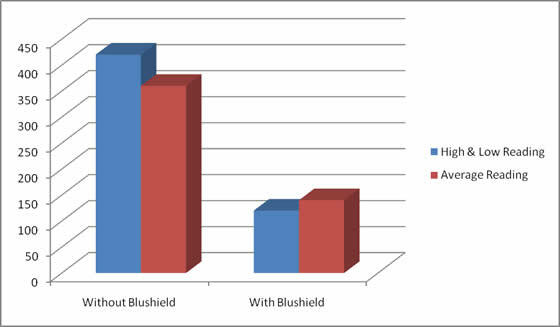 When we add up the monetary gain from installing a Blushield the results show a significant return. Especially for an industry that works on small margins. A 10% increase in egg production appears to be the average over the testing period and the mortality rate fell from around 100 per month to an average of 17. An overall savings in deaths alone of $1,369.50 per month! Savings of over $16,434 per year! It was also evident that one of the longer term effects the Blushield will help with is the term of the hens laying life, which was extended out by as much as 20 weeks per hen. Egg size and quality of the eggs increased, larger eggs were laid compared to the control house. It is clear that the Blushield has a significant effect on egg laying chickens. The poultry farm would be quickly able to reap the benefits and the Blushield would more than pay for itself within the first month, making future production more profitable and to also be of benefit to the hens in the hen house. 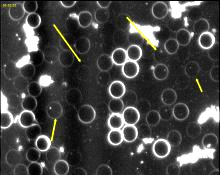 SOMATIC CELL COUNT TESTING IN DAIRY COWS (WHITE BLOOD CELLS IN MILK). To further corroborate the cows do not have cell count changes due to psychosomatic factors. We look once again to our dairy herd. When the milk is received at the dairy processing plant it is automatically checked for the level of somatic cells present. All milk contains some level of somatic cells; the level of cells present is an indication of the quality of the milk and the health of the cows. Whenever a cow is subjected to stress, such as an injury or disease, the cell count rises. 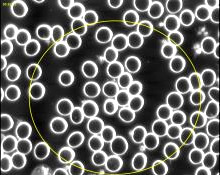 This is Mother Nature in action – white blood cells are created to fight off the stress.